Add a burst of fiery flavor to your popular meat dishes with this Oasis Grill Blazin' barbeque sauce! 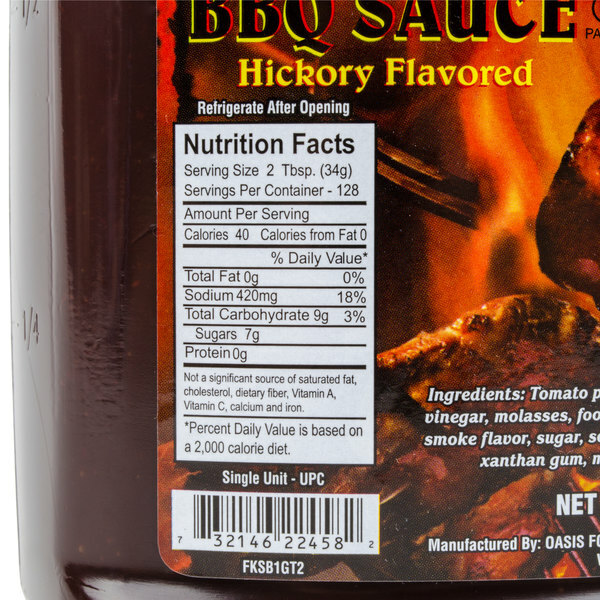 This Oasis barbeque sauce includes a balanced blend of sweet, savory, and smoky ingredients. The vinegar, tomato, and garlic flavors are enhanced with sweet molasses and natural hickory smoke. Not just your average barbeque, this Grill Blazin' barbeque sauce kicks up your grilled meat's flavor and makes for one excellent marinade. Rich brown in color, the barbeque sauce has a smooth, thick texture for cascading across your customers' favorite beef, chicken, or pork dishes. 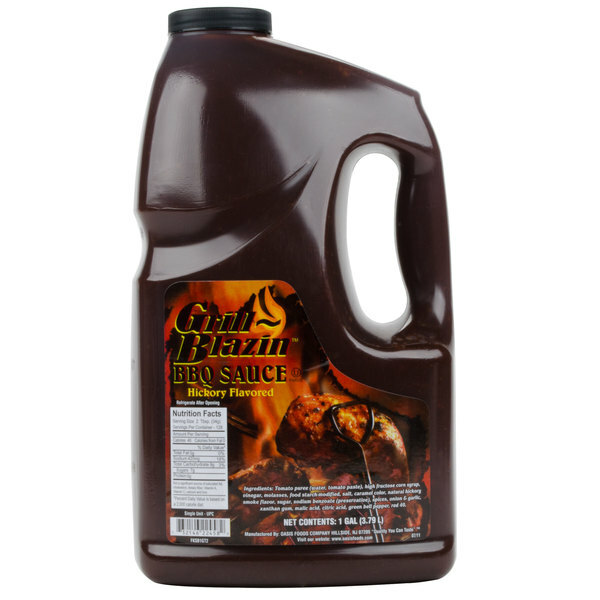 Keep your steakhouse or restaurant in great supply of Oasis Grill Blazin' barbeque sauce with this 1 gallon container! Much easier than opening multiple bottles of barbeque sauce, this bulk plastic bottle is great for storing, and the sauce does not need to be refrigerated until after opening. Its useful handle and resealable cap eases handling and transport through your venue while making it easy to pour barbeque sauce into smaller bottles for table service, rather than serving in individual ramekins. In addition to its convenient packaging, this barbeque sauce turns any recipe ablaze with great flavor. Use it for meatloaf, chili, burgers, chicken tenders, and more! I had never heard of this brand before but my friend told be to give it a try. It is really good and at a good price. I wont grill again with out it! 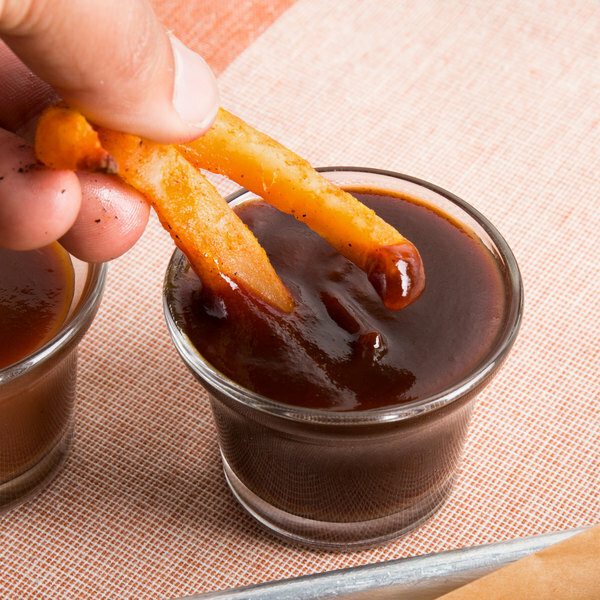 Your basic barbecue sauce that is great for a dipping sauce or glaze. A nice barbecue flavor and well packaged in the bulk gallon size jars. The Oasis grill balzin' barbecue sauce is perfect for basting on our chicken quarters. The sauce has a nice flavor and is really a great buy. A nice thick, bold flavored barbecue that is well priced and perfect for glazing chicken. The barbecue has a really nice taste and also makes a great dipping sauce. The Oasis blazin' barbecue sauce is a really great tasting sauce. 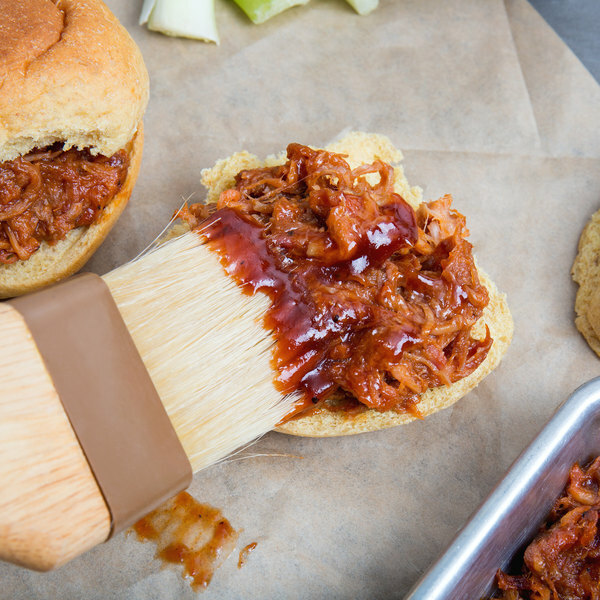 The heat level is perfect and is great on pulled pork or grilled chicken. A great BBQ sauce with a touch of heat. Great for glazing ribs. We thin it out a little bit with vinegar and soy sauce for each slathering. Got to enjoy the names these things are sometimes given. The name draws you in but the flavor keeps you coming back. This is a good barbecue sauce. Very tasty and was a very good purchase. the sauce adds a great deal of flavor to the meat kind. I will be sure to keep it in stock. We use to make our own BBQ Sauce. Then we tried this sauce. We we're very happy we did. it's nice and thick, It taste great and the price is good too. Last year we bought my mom half a beef for Christmas. This year I'm planning ahead an ordered extra of the Oasis Grill Blazin' Barbecue Sauce for her. We love it and think she will too. The Oasis Grill Blazin' Barbecue Sauce sold 4 1 gallon jars. It has a sweet smoked flavor your customers will love. We use it with our pulled pork ad other barbacue items. The price is right. This is a great, thick barbecue sauce, it really sticks to your product. It has a great combination of flavors and seems to be pretty high quality. This is one bold BBQ sauce!! It has a nice flavor that is great on ribs or even in a simple meat marinade!! Great bulk item!! Kickin' BBQ sauce! The Oasis brand BBQ sauce is very good. It has a nice tangy flavor to it. I love the fact that I can buy these in gallon sizes by the case. BBQ sauce is sauce that goes well with any kinds of meat, but it is used served with grilled meats. The Oasis brand offers a great tasting BBQ sauced that is value-priced and that is very convenient to use in a commercial or a home kitchen. I use it with steaks and rib at home and I really like the money that I saving on sauce here rather than buying the small 16-ounce bottles at the supermarket.